Individual project: Students to brainstorm and consider the ideas to develop a branding strategy for a given organization/product. You may choose from the organization (a BANK) or the product (an orange). 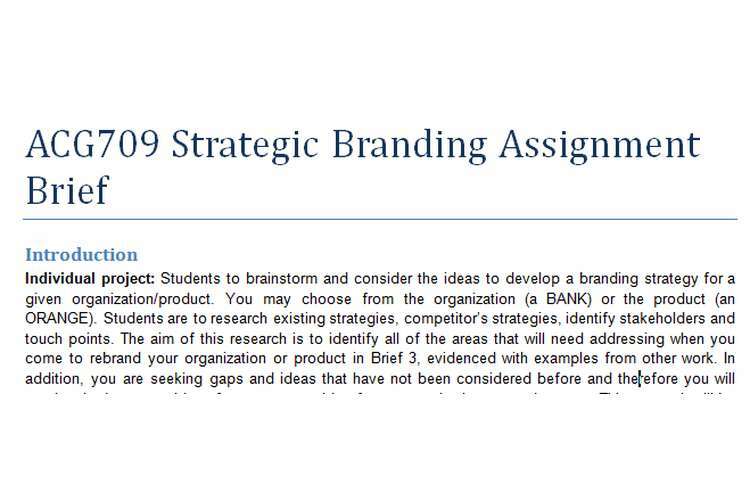 Students are to research strategy, competitor’s strategies, identify stakeholders and touch points. The aim of this research is to identify all of the areas that will need addressing when you come to rebrand your organization or product in Brief 3, evidenced with examples from other work. In addition, you are seeking gaps and ideas that have not been considered before and therefore you will need to look at great ideas from areas outside of your organization or product area. This research will be used to create your project proposal, brief 3. As a guide, please explore 6 branding strategies – 3 from your sector and 3 from outside your sector. Within those branding strategies explore 10 examples of stakeholders and touch points; 3 or 4 pre-purchase, 3 or 4 purchases and 2 or 3 post purchases. You will find some organizations would be stronger pre-purchase and purchase but not good at post purchase and others would be better purchase and post purchase, for instance. You can be informed by interesting ideas and ideas in areas that your sector does not yet consider. Please save your file Your_name_ACG709_A2_Proposal.pdf for upload. Proposals will be peer reviewed in class and uploaded to Cloud Dakin for assessment. All submissions will be available on Cloud Dakin for everyone to review. Purchase and post-purchase points. Bullet point identification of stakeholders, touch points and branding terminology. Document presented in a coherent manner, referenced, without error.